At Photokina 2016, SanDisk announced the world’s first 1TB SD card, but that never did hit shelves. 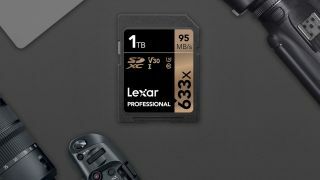 Lexar, however, has beaten every other card manufacturer to the punch by revealing its own 1TB SDXC memory card at CES 2019, and it’s already on sale. The Lexar Professional 633x SDXC UHS-I card falls under the fastest speed class (Class 10/V30 for video recording), boasting a read speed of up to 95MB/s. To put that kind of storage into perspective, you should be able to fit about 650 minutes worth of 4K footage on a single Lexar Professional 633x SDXC UHS-I card. This whopper of an SD card comes to us “almost 15 years” after Lexar announced a 1GB option, showing how far the company has come. It was only two years ago that Lexar’s parent company Micron discontinued the brand before selling it off to Chinese company Longsys in 2017. Lexar then made a comeback in late 2018. The card is on sale for a recommended price of €439.99 (about $507/£397/AU$708).